Assists for Illnesses and Injuries :: Read "Factors of Assists." The Assists for Illnesses and Injuries Course is a Free Online Course you can begin right away. It is our service to you, free of charge. ASSIGNMENT >> 1. Read "Factors of Assists." An assist, then, can be described as a Scientology process which is done to alleviate a present time discomfort. A process is an exact series of directions or sequence of actions taken to accomplish a desired result. There are many processes contained in the materials of Scientology, but assists make up a class of processes in themselves. All Scientology processes address and handle a wide range of conditions affecting the spirit, the being himself. 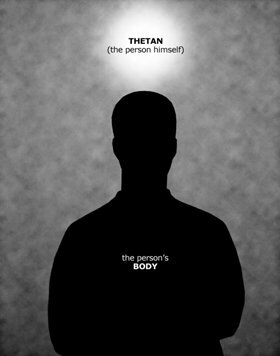 The spirit in Scientology is called the thetan, by which is meant the person himself—not his body or his name, the physical universe, his mind or anything else—it is that which is aware of being aware; the identity which is the individual. The term thetan was coined to eliminate any possible confusion with older concepts. It comes from the Greek letter theta which the Greeks used to represent thought or perhaps spirit, to which an n is added to make a noun in the modern style used to create words in engineering. Probably the greatest discovery of Scientology, and its most forceful contribution to the knowledge of Mankind, has been the isolation, description and handling of the human spirit. In Scientology it can be demonstrated that that thing which is the person, the personality, is separable from the body and the mind at will and without causing bodily death or mental derangement. In ages past, there has been considerable controversy concerning the human spirit or soul. And various attempts to control Man have been effective in view of his almost complete ignorance of his own identity. As you know that you are where you are at this moment, so you would know if you, a spirit, were detached from your mind and body. Man has not discovered this before because, lacking the technologies of Scientology, he had very little reality upon his detachment from his mind and body. Therefore he conceived himself to be, at least in part, a mind and a body. The entire cult of communism is based upon the fact that one lives only one life, that there is no Hereafter and that the individual has no religious significance. Man, at large, has been close to this state for at least the last century. The state (condition) is of a very low order excluding, as it does, all self-recognition. The spirit, then, is not a thing. It is the creator of things. By spiritual means, but means which are as precise as mathematics, a host of bad conditions of life may be remedied in Scientology. Illness and malfunction can be divided into two general classes. First, those resulting from the operation of the spirit directly upon the communication networks of life or the body. And, second, those occasioned by the disruption of structure through purely physical causes. The term psychosomatic means the mind making the body ill or illnesses which have been created physically within the body by derangement of the mind. Psycho refers to mind and somatic refers to body. It can be demonstrated that a person is not a body, but is, in fact, a spiritual being, called in Scientology a thetan. Unhappiness, inability to heal and psychosomatic illnesses (which include some 70 percent of the illnesses of Man) are best handled by immediate address of the thetan. Illnesses caused by recognizable bacteria and injury in accident are best treated by physical means. These fall distinctly into the field of medicine and are not the province of Scientology, even though accidents and illness and bacterial infection are predetermined in almost all cases by spiritual malfunction and unrest, and conditions in accidents are definitely prolonged by any spiritual malfunction. Thus, we have the field of medicine addressing the immediate injury (such surgical matters as birth and acute infection, and such things as bruises and scrapes resulting from accidents) as well as the administration of drugs and antibiotics to prevent the demise of the patient in a crisis. This is the role of medicine. Where tendency to disease or injury exists, or where disease or injury is being prolonged, or where unhappiness and worry causes mental or physical upset, we are dealing in the realm of Scientology. For such things are best healed or best prevented or best remedied by immediate and direct recourse to the thetan and its action on the body. The only truly therapeutic agent in this universe is the spirit. In Scientology this has been demonstrated with more thoroughness and exists with more certainty than the physical sciences or mathematics. A Scientologist can help make an individual well and happy simply by addressing the human spirit. a process which can be done to alleviate a present time discomfort and help a person recover more rapidly from an accident, illness or upset. a body wound or shock produced by sudden physical injury, as from violence or an accident. an exact series of directions or sequence of actions taken to accomplish a desired result. the time which is now and which becomes the past almost as rapidly as it is observed. It is a term loosely applied to the environment existing in now. the person himself—not his body or his name, the physical universe, his mind or anything else—it is that which is aware of being aware; the identity which is the individual. The term thetan was coined to eliminate any possible confusion with older, invalid concepts. It comes from the Greek letter theta which the Greeks used to represent thought or perhaps spirit, to which an n is added to make a noun in the modern style used to create words in engineering. an exclusive group of people who share an excessive devotion to some person, thing, ideal, etc. the political theory or system in which all property and wealth is owned in a classless society by all the members (workers) of a community. It enforces extensive negative controls on personal liberties and freedom and collective needs of the masses overrule individual rights. a future life, the world to come; a life or existence after death. a category, type, class or kind of thing of distinctive character or rank. a body of matter (with no specified shape or size). a wavelength is a characteristic of motion. An orderly wavelength is a flow of motion. It has a regular, repeated distance between its crests (high point of the wave). Take a rope or a garden hose and give it a flip. You will see a wave travel along it. Energy, whether electrical, light or sound, has some such pattern. This is a smooth-flowing wave. Its length is between crests. It is measured in units of length such as centimeters or inches or feet. a word used in Scientology to designate any body sensation, illness, pain or discomfort. Soma means “body” in Greek. single-cell organisms, some of which cause disease. given a direction or tendency toward a particular course of action beforehand. substances that are able to kill or inactivate bacteria in the body. Antibiotics are derived from microorganisms (very small living organisms) or are synthetically produced. death; the end of a person’s existence.